Training for your first race is exciting but can scare the crap out of you. You may find yourself freaking out one minute and totally cool beans the next. This reaction is totally normal! Why, you ask? Well, doing something new, different, unknown will cause your brain to “freak out” because it is how we are wired. This “freak out” is a typical reaction that your brain has when encountering any new and unknown situation. Ever hear of the “triune brain model”? As a sport psychologist, this model helps me explain to athletes why we might experience various emotions and challenging psychological states when encountering an unknown (but totally typical) situation. 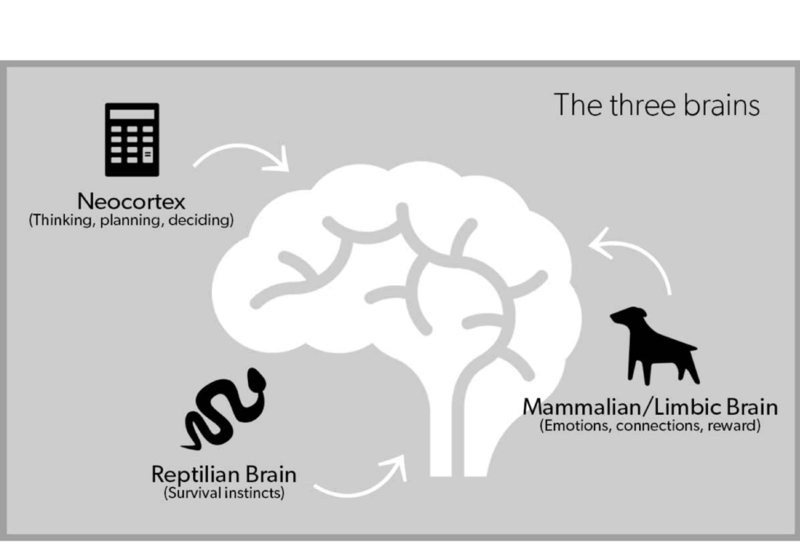 The “triune brain model” explains that human behavior is influenced by three major clusters of brain structures – the “neocortex”, the “limbic brain (or mammalian brain)”, and the “reptilian brain.” Our brain’s main job is the keep us safe and alive and these main structures help do that for us. However, when encountering an unknown situation, even one that is not life threatening, these structures can hi-jack our goals if we don’t understand what is going on. There are advantages and disadvantages that the triune brain gives us as humans. Let’s take a look at each structure and highlight advantages and disadvantages that might creep up as you train for your first race. The neocortex is what makes us human and different from other animals. The neocortex is very logical, unemotional and in-a-nutshell it is involved in planning, modeling behavior, making decisions based on past behavior and/or information, and thinking about future behavior or options. For example, when we imagine crossing the finishing line in three months, that comes from the neocortex part of our brain. Likewise, when we imagine bonking, getting injured or being unable finish the race, that too comes from the neocortex. The disadvantage of this part of the brain is that sometimes we imagine negative outcomes and build a story (fiction) in our minds that is not real. If we don’t catch this when it happens and allow the story to build, this will trigger the next part of our brain – the limbic systems (which is where our emotions are derived from). It’s likely that a negative image or story in our mind could trigger feelings of anxiety, stress, concern, and self-doubt. However, the advantage of the neocortex is that we can train ourselves to create positive images of future outcomes (via visualization techniques) and therefore trigger positive emotions such as feeling victorious, determined, and courageous. 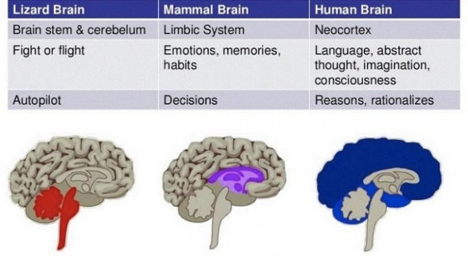 As mentioned above, the limbic brain (mammalian brain) is our emotional system and social-relational system. When we feel a sense of community, support, and encouragement, it comes from this system, as well as when we feel disrespected, jealous, embarrassed etc. it comes from this part of our brain too. The disadvantage is that when feelings are triggered, what triggered them, such as a negative fictional story (from the neocortex), can seem real because the emotions are now present, whereas before it could have been a thought with no feeling attached to it. When a negative feeling comes into play we tend to think of it as “real.” For example, you post a picture of your 3-mile training run with “#feelingaccomplished #longestruntodate” on social media and you get several “likes” and feel proud. Then someone whom you have never met in the “real world” posts a comment “3 miles is nothing, I did 20 today”. This particular comment could trigger your brain to feel self-doubt or inadequate. The advantage is that feelings are temporary. Often we can learn to cope, distract or even shift them with some training. In this example, we could tell ourselves “Well, I had a whole training group today that thought my run was a big accomplishment. They support me when it matters.” or “I feel crappy from that person’s comment but I don’t even really know her, so why should I let her comment minimize my accomplishment.” It’s important to remember that this part of the brain speaks an emotional language and therefore rationalizing (neocortex function) with it will not make you feel better. You must learn to emotionally cope or sooth the negative emotions. The reptilian brain, the most primitive of the brains, controls the body’s vital functions such as heart rate, breathing, body temperature and balance. It is the true “security system” of our brain and responsible for the flight, fight, freeze responses. In case you didn’t know, flight, fight and freeze are biological reactions meant to keep us safe. However, when these reactions get mis-triggered it is interpreting the “unknown” as a life-threatening event. This may sound silly, but this part of your brain cannot distinguish the difference between a real life threatening event, such as being eaten by a bear, with a non-life threatening event like DNF’ing your first race. For example, the reptilian brain could get triggered by imagining not finishing the race (neocortex function), feeling embarrassed (mammalian brain), and subsequently people laughing at us. Fear of being socially ostracized is a huge reptilian brain trigger, because back in the day when we were cave people we needed our pack/tribe/social group to survive. The advantage of this part of the brain is that it really wants to keep you safe. If you can catch the emotions building and manage them before they start to escalate into panic or fear you prevent this part of your brain from being triggered. The important thing to remember is that this part of the brain is not rational. Overall, training for something your body and brain has never experienced is a major feat, and one that your brain does not take lightly. But as you read, our brains are incredibly advantageous when it comes to encountering the unknown. We can use all the basic psychological skills training such a goal setting (neocortex skill), visualization (neocortex skill), deep breathing/relaxation techniques (mammalian and reptilian coping skill), meditation (mammalian and reptilian coping skill), positive affirmations (mammalian skill), etc. to train our brains to be able cope with the unknown with courage, focus, grit and fun!